The Reserve Bank Of India, Service Board, Has Recently Posted A Job Notification For The Posts Of The Officer In Group 'C', So Eligible Candidates Can Apply For Job Before The Last Date, 8th Of January, 2019. Dear Friends Please Do Read The Recruitment Notification For More & Better Understanding, It's Given Below. Various Officer Post →61 Vacancies. 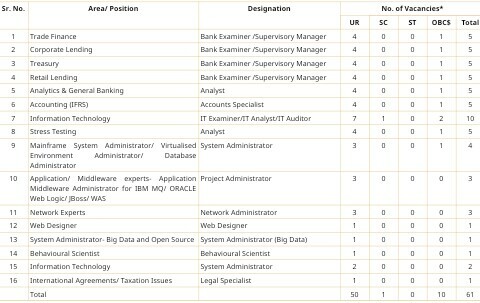 Total Number Of Vacancies →61 RBI Grade C Online Vacancies. B. Eligible Criteria For RBI Recruitment 2018 Notification. Age Limit →25 Years To 35 Years, As On 1st Of December, 2018. Educational Qualifications →Minimum Qualifications Requirement Is BE / B Tech / M Tech, Post Graduate Degree. Mode Of Examination/Selection Process →Preliminary Screening/Shortlist And Personal Interview. Online Application/Examination Fee →₹600 For General/OBC & ₹100 For ST/SC, Through Online Payment Mode. Last Date For Online Application Form →8th Of January, 2019. Examination Date →For RBI Exam Date, Please Do Check Out The Official Website Regularly, Link Is Pasted Below. Admit Card Download →For RBI Admit Card Download, Do Regularly Check Out The Official Site. Result →To Check Out The RBI Exam Result, Click Official Website Here>The Official Website Of RBI. Now Apply For RBI Recruitment 2019 Apply Online. Do Visit Here Daily For Latest Government Jobs News Alerts, Till Then Stay Safe And Blessed.